Farmer George with Evie and Lilly. Farmer George’s Busy Morning and FarmTimeStories.com began two years ago as a crazy idea while Clare and I watched over our son, after he had his tonsils out. 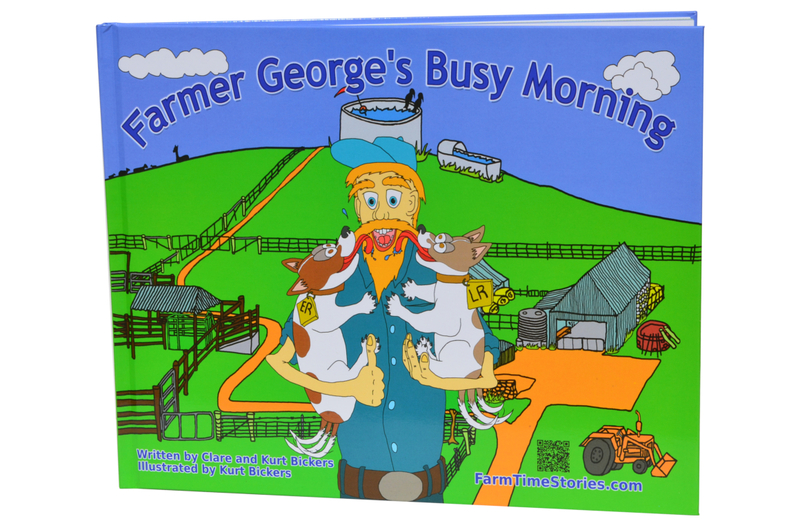 The illustrations and words for “Farmer George’s Busy Morning” and getting photo’s together to make the website have taken us two years to complete. Farmer George’s Busy Morning is our family’s perspective of farming in the Irwin Valley, Western Australia. We have been there for the past 20 years and learnt the hard way from the ground up.The book is the first few hours of every morning on the family farm. It revolves around the care of our animals. The dogs in the window. Farmer George feeding an orphan calf. We show children the responsibilities of looking after your animals, from feeding them, to watering them and checking on their well being. While Dad’s best little mates, Evie and Lilly, go about their day, oblivious and happy to what is going on. They always seem to be more interested in chasing after each other or anything else that will run on the farm. The Alpacas are on guard. My dad is the reluctant star of this book, in a small way he represents all us farmers across the world. Trying to do their best and the right thing by their animals with the limited resources they have. The book also includes a question and answer section at the back to help stimulate some conversations with your children about the book and the world around us. A little goat waiting for his mum. There are also some black and white pictures which you can copy and get the children to colour in and a photo collage to show people the real world where all the information is coming from. If you would like to buy a copy of our book please click on the link. You can buy direct from us presently if you are in Australia. If you are from overseas please see click on the link to Amazon.com. One of our little red headers. Please explore our farm by looking at the picture sliders and videos on this website. Page 1 of the book is a real life over view of our little farm. Page 3 of the story shows how excited the Evie and Lilly are to be off to start the day…and see their friends. 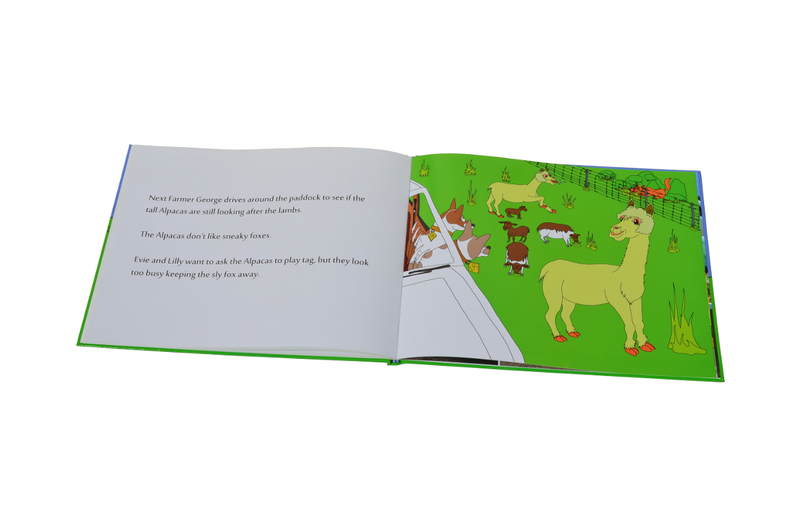 Page 10 of the story shows the cool Alpacas looking after the lambs and keeping the foxes away from them.